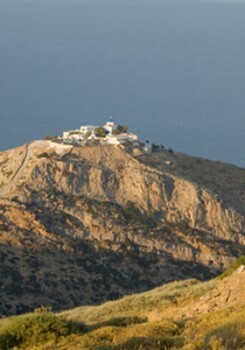 Monastery of Panagia Kastriani, one of the spectacular views on the Island of Kea. 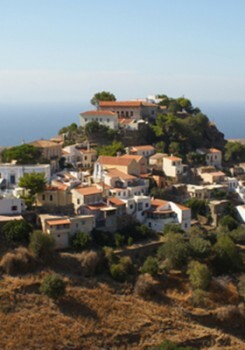 Kea's main town of Ioulida with traditional, although not typically Cycladic, architecture. Kea belongs to the Cyclades group of islands. Also referred to as Tzia in everyday Greek, the Island of Kea is a one-hour boat ride from the Province of Attica. Athens is the capital, not only of Greece, but also the capital of the Province of Attica. Kea is conveniently located, cosmopolitan and relaxed at the same time. Many Athenians have summer homes there, because of its proximity to Athens. An ideal island destination for a short weekend jaunt on a yacht. Kea is a blend of craggy coastline and rolling hills. 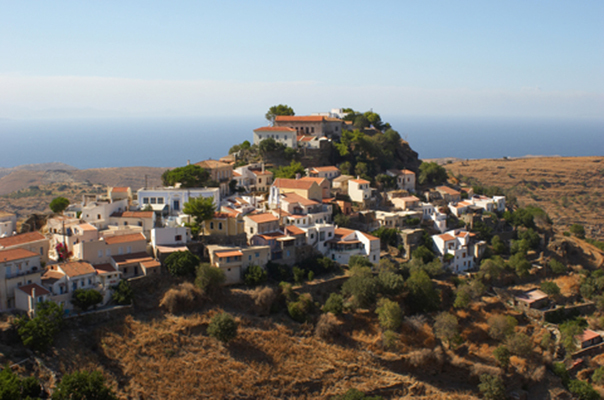 One of the amazing points of interest on the island is the Panagia Kastriani Monastery. At the peak of Kastri, a sloping mound of rock and dry brush exposes a white-washed monastery, a Cycladic breeze and the smell of dry thyme – magical flashes on the Island of Kea. Kea is spontaneous with an uneven coastline of rock, trees and brush. The tougher the terrain the tastier the wine and the honey. Organic farming has taken hold and is worth the trek for a tasting. Stiff, wind-swept and dry, Kea also boasts ancient water springs, green and fertile, oak forests and valleys, flanked by marvelous mountains. Perhaps the lavish view of an endless stretch of water and rough Cycladic terrain, from the top of Kastri Hill, is the answer. The 18th Century monastery of Panagia Kastriani, is the protectorate church of the island, shielding it from the wild and unruly Cycladic winds. Since monks no longer inhabit the Monastery, guests are frequently accommodated in the monastery’s simple and quiet rooms. The rooms, dining room and other parts of the monastery meet the visitor with serenity and nature’s boundless gifts. 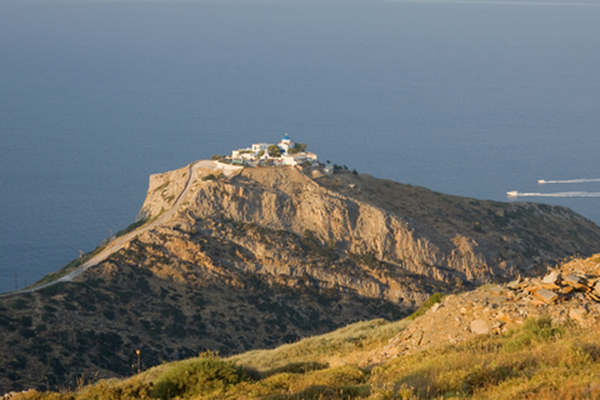 Panagia Kastriani’s monastery is at 180 metres above sea level. For those yachting or sailing, the sea surrounding the monastery offers sea caves and beaches to explore – the wandering eye finds the unexpected. The walk up to Panagia Kastriani is also spectacular. Trekkers will be inspired and find joy in Kea’s well maintained network of paths. They will enjoy hiking and walking, especially in the Southeastern part of the island, where a number of rare plants endemic to Kea, grow on hill contours and turns, and are protected under the NATURA 2000 programme. 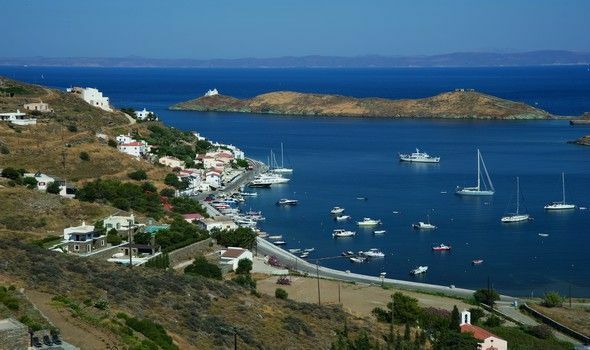 Yachters prefer Kea as a destination because they moor at the well-known port of Vourkari, or drop anchor for a while at any one of Kea”s many natural ports before sailing on to the neighbouring Cyclades islands. 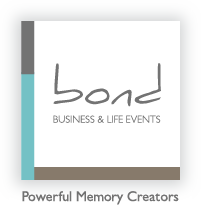 Please sign up to An Insider’s View to regularly get a glimpse of our Greece less known and off the very beaten path. Our view, from the shutter eye, of the real and profound scope of Greece’s beauty.